11 Years with Ellis and Tyler! Eleven years ago, Ellis joined me on Z88.3 Mornings, and it’s been a whirlwind ever since! As we celebrate our eleven year anniversary on Monday, February 11, we would love for you to celebrate with us! Every celebration needs a little something sweet! 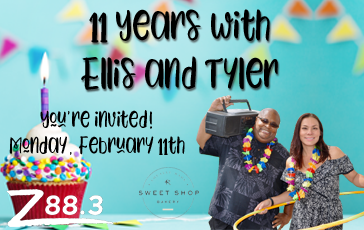 Join us all morning on February 11 for Ellis and Tyler Trivia. We’ll be giving away cupcakes from our friends at 4 Rivers Sweet Shop! Just be caller number 11 when we make the announcement. It’s our way of saying thank you for being part of Z88.3 Mornings for the past 11 years.